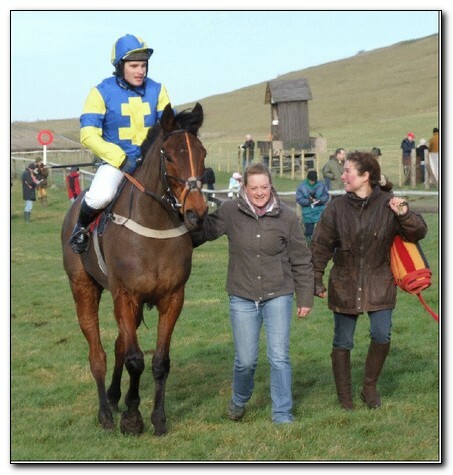 The two day Point-to-Point Owners and Riders (PPORA) meeting at Barbury Castle attracted a massive 501 entries. Frozen off the previous weekend, the course looked in great condition. 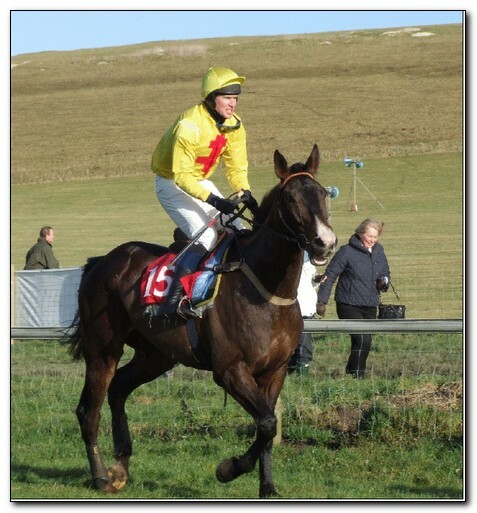 Set in a natural amphitheatre high on the Marlborough Downs, it’s a delightful setting, the drive up from Wroughton over the Ridgeway gives a spectacular view of the whole course and for those racegoers who have never been its well worth a visit. There were some new sponsors for the two day meeting including Jockey Club Estates who took over managing the 500 acres of training grounds in Lambourn with responsibility for the complete relaying of two artificial gallops on Mandown. 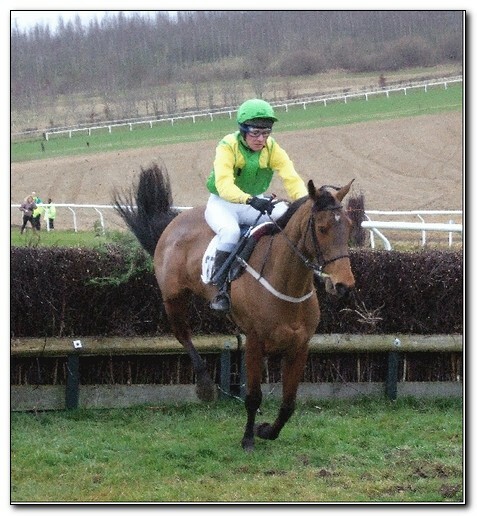 John Beasley, photographer and editor of the Big Green Annual had teamed up with the new Racehorse PtP Sponsorship scheme to give their support to the Club Conditions race. The Annual is well worth purchasing each year for its brilliant photographs capturing all that’s good about racing between the flags. The sun was shining at Barbury on Saturday morning. Alan King’s powerful string had just come back from the vast gallops and everything was set fair for a cracking day’s racing. The maximum number of twenty had been declared for the opening race of the two day fixture starting at 11 am. Victory went to Gentle George from Steve Flook’s yard. Always up with pace he soon fought off the challenge of Flax Hill (Peter Mann) and stormed home to win going away by 8L. Ridden by Richard Burton, this giant long striding type has now won three of his four races following two victories last season at Eyton-On-Severn (unseated on his other run). 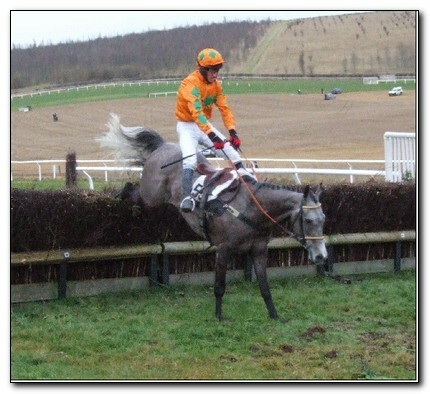 Bought unbroken at the November 2007 sales for just £2,200 (stands eighteen hands) he looks progressive and can win again. 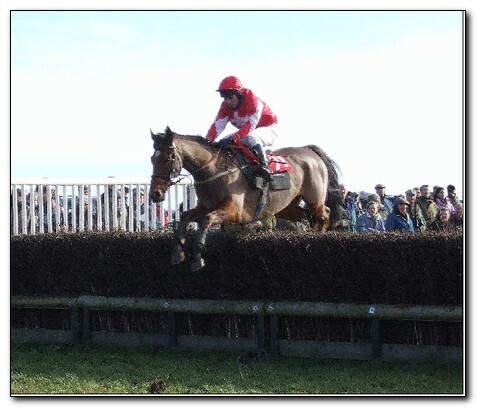 Flax Hill is a very consistent mare and she deserves to win a race on this running, finished a gallant fourth last time in the Connolly’s Red Mills Ptp Final at Cheltenham, a race she will no doubt be aimed for again (the first four qualify in this sponsors race for the £7,500 final). Mr Goofy was third at a big price for Jeremy Mahot. The big eyecatcher in this race was Fox John. Given a considerate ride in fourth by David Bass following his similar run last time at Dunthrop when third behind impressive winner Turthen, the John Manners gelding prior to Dunthrop had not been out since finishing lame in a beginners chase at Worcester in 2006 but had won two points at Siddington and Andoversford. The two runs will have brought him on and should be spot on next time and will be interesting if he reappears on Sunday at Dunthrop. The favourite was Grenfell following her victory at Cottenham. She was also up with the pace but struggled to get home in the prevailing conditions. Others to note - Absolutely Barking was still going well when unseating Ally Stirling at the eleventh, newcomer U B Careful had not been asked a question when unseating Joel Thomas at the tenth, Shady Hollow, a winner at Dunthrop, also ran well for a long way for Ryan Bliss. Just like the first race, the maximum number of twenty runners were declared and it saw a victory for the ex Irish trained Wickford, now trained by Caroline Griffiths a winner of four races in Ireland including a beginners chase at Fairyhouse. This ten year old gelding was purchased for £15,000 and it looks like money well spent. Wickford was always up with pace on the first circuit behind the pacesetters of Frosty Jak, Honest Endeavour and Armoury House. Taken up to join the leaders by Adrian Wintle, Wickford stayed on well to win by 2l and hold off the persistent challenge of Man From Highworth on the rails. Just like Fox John, this was another encouraging runner from the yard of John Manners, given better ground he is one to watch next time. Rockwithacaveman was a gallant third giving the impression he is one very much to follow. This progressive seven year old was the first horse to win five races last season and subsequently won six of his seven races, his only defeat came when favourite for a Novices Hunter Chase at Exeter. The form of this race was further enhanced by Who Else Knew finishing fourth, a winner of eight races. The favourite was Distant Thunder for Guy Landau/Richard Burton is this useful ex chaser ran well before weakening and will come on for the run. The first race to be divided with twelve runners declared. Lord Attica became the fourth winner to come out of Turthen’s Dunthrop race (Turthen easy winner of the Ladies Open on the second day, Grenfell & Moscow Court). Held up on the first circuit, Lord Attica took it up at the open ditch and came clear for Richard Woollacott by twelve lengths with Alroyal and Lord Anner battling it out form the runners up spot. The winner is trained by Bradley Clarke and this was the ten year old gelding’s third victory (weak in the market (3/1 from 5/4). Karinga Lane was nibbled at in the ring (5’s from 3’s) and ran a reasonable race to be last of the four finishers, however David Mansell failed to weigh in, was fined £60 and Karinga Lane was disqualified. Selassie for the yard of Maz Scudamore ran well for a long way and is another to benefit for the run. 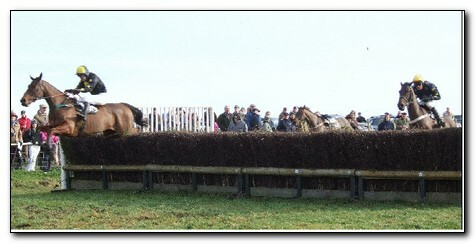 A newcomer to Pointing won the first division of the short maiden in Pimbury. This nicely bred seven year old was trained by Robert Alner under rules but is now trained by Jane Western for her yard at Forde Abbey in Somerset. Ridden by Ian Popham who has just started as amateur jockey with Paul Nicholls stable having moved from Phillip Hobbs yard. Pimbury was held up for much of the journey as Ashclyst, Astrop Road and the hard puller Matako setting the running for most of the way, Pimbury gradually warmed to the test and went clear two out but somewhat wandered around approaching the last as Orient Legend and Buckingham Boys came with promising runs, however a loose horse alongside Pimbury seemed to assist him and he stayed on again. There was a big racecourse whisper for Orient Legend who had pulled up on his two other runs for Jenny Pidgeon, he had obviously been showing better form at home and should find a maiden. As for some of the others, Quintero looks a nice prospect for Feargal O’Brien, looked well in the paddock and was still travelling strongly when falling at the eight bringing down another well fancied newcomer in Elevenses from Richard Barber’s yard giving Rachel Green no chance. Doug departed at the first, Ashclyst ran well for a long way. Mendip trainer Patrick Bryant was successful in the second division with newcomer Cannington Brook for jockey James Tudor, taking it up on the second circuit and staying on well from the favourite New Series, this ex Irish pointer is now with Alison Dare and losses should be recouped next time. Wizard Roc ran well for a long way, Lord Bellamy fell at the seventh bringing down Stormhill Armour. The two Restricted races were the most interesting races on the card and should throw up several winners, the ground had become very testing by the end of the day and many of the runners were struggling to get home. The first division attracted fifteen runners including five who had won their last race, Dr Flight, Ellies Horse, Il Mariano (fav), Tango With a Mango and The Chisholm. Victory went to Overbury Pearl for Oxfordshire trainer Alan Hill and giving James Tudor a notable double. 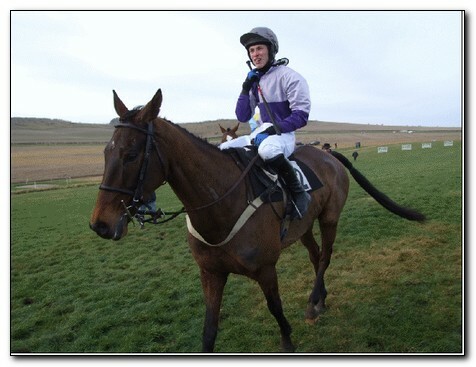 A winner of his maiden at Eyton when with owner trainer Patrick Johnson, he came late that day and the stewards had a word with connections following his disappointing run at Garnons (lost a shoe that day). Overbury Pearl was always front rank alongside Jolly Boys Outing and All Thyme Greats, they gradually pulled clear ahead of The Chisholm and Il Mariano who faltered in the testing going, they will be seen in a better light given better conditions. 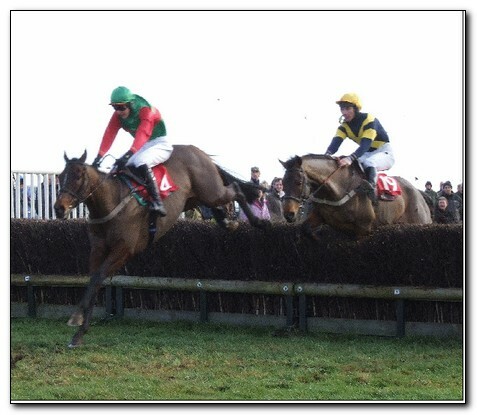 It had gone distinctly chilly with the breeze sweeping down off the Downs but this was arguably the best looking race with no less than four runners in the line up who had all won at Dunthrop shortly before Christmas - Definite Approach, Glen Tulloch, Manta Point and the hot favourite Top Benefit. It turned out to be a war of attrition with only two finishing, the others all pulling up. The punters went home happy though as Top Benefit came home well clear though the even money chance made a dreadful mistake at the last and David Mansell did well to stay on board. Up The Boreen was the only other finisher some thirty lengths behind the winner. The North Nibley yard of Julie Houldey have been in fine form all season with Were Confused winning the Mens Open on the second day of the meeting and Top Benefit can win an Open on this showing. A really interesting day and with admission of £10, excellent value of money.